For three generations, Kufa & Son Heating and Air Conditioning has provided Carlinville and the surrounding areas with high quality heating and cooling services. Joe Kufa began working in the furnace, sheet metal, custom sheet metal roofing and guttering industry in the late 1940’s. After mastering the trade in 1956, he decided to open his own business. 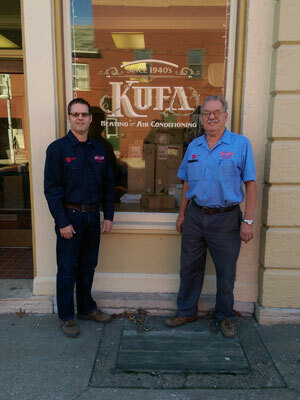 In 1959 his son, Jeff Kufa, joined his father in the family business. The company started installing and servicing the air conditioning industry, along with some light commercial work. Scott Kufa, Jeff’s son, started working in the HVAC business alongside his father and grandfather, while still in high school. In 1989, after graduation with a degree in business, Scott joined the firm. By this time the industry had evolved into more efficient furnaces and A/C systems as well as geo-thermal heating and air conditioning and WiFi compatible controls. Kufa & Son, Inc. has vowed to stick by their motto of “Keeping You Comfortable For 3 Generations.” and look forward to standing by that commitment for years to come.